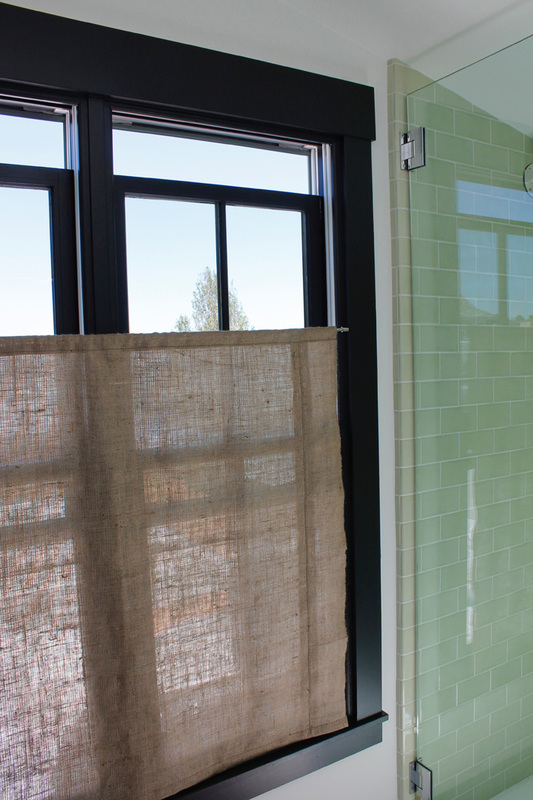 The upstairs bathroom is put back together and for the most part finished. 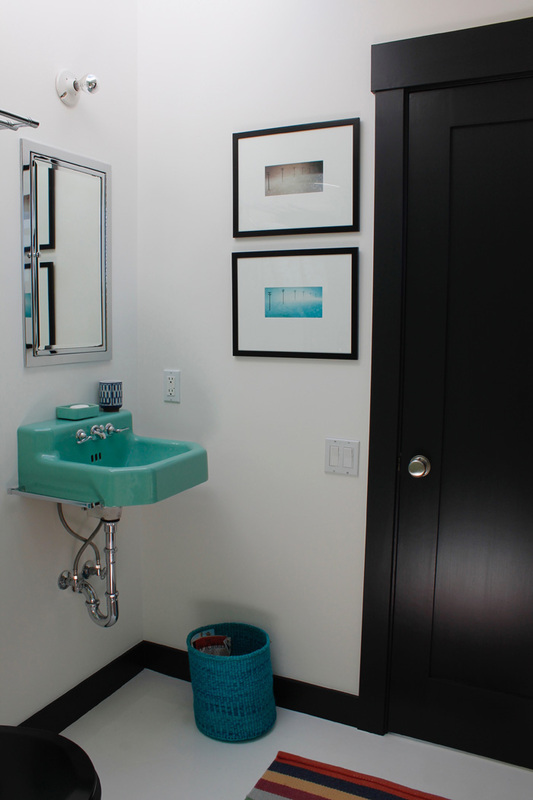 Pretty much everything that happened in here was precipitated by removing the original chipped pedestal sink. Once I cut into the wall to add blocking to support the new (old) sink, I knew I'd be painting, which led me to consider color changes, yada yada yada. 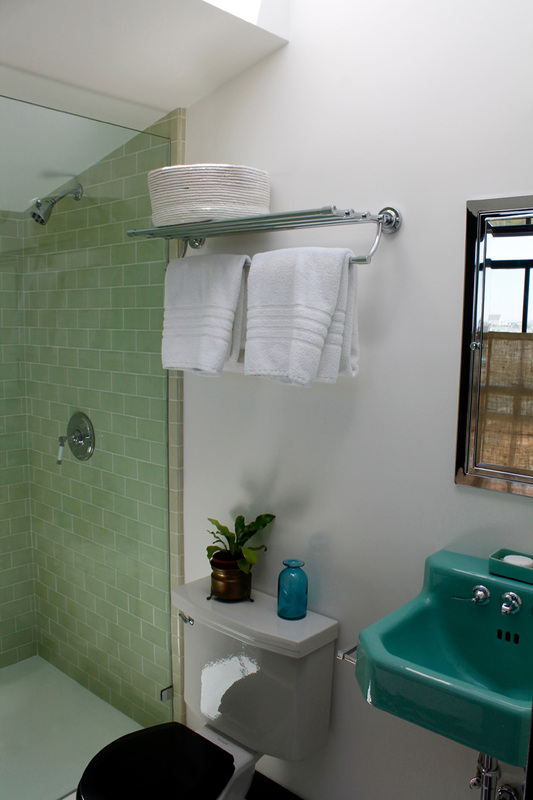 My main consideration in this bathroom is that I have three mismatched items in here -pale green subway tiles, a vintage white toilet and a vintage green sink. How in the world is this possible in this new house? Well, there have been two mishaps. 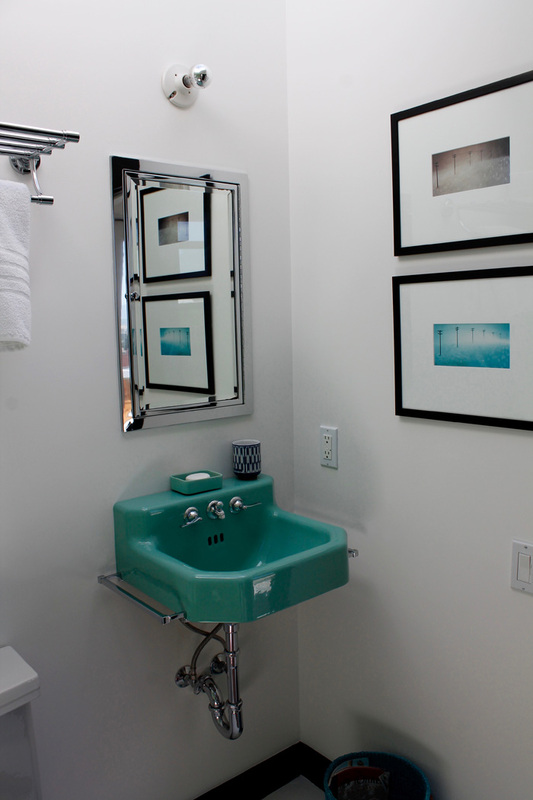 The original sink and toilet, both of which were from the Kohler Kathryn line, broke. The sink chipped and the toilet literally tipped over and shattered (see this post for a further explanation). As I do with all my design choices, I just bought individual things that fancied me, I never think about how things are going to "go together". 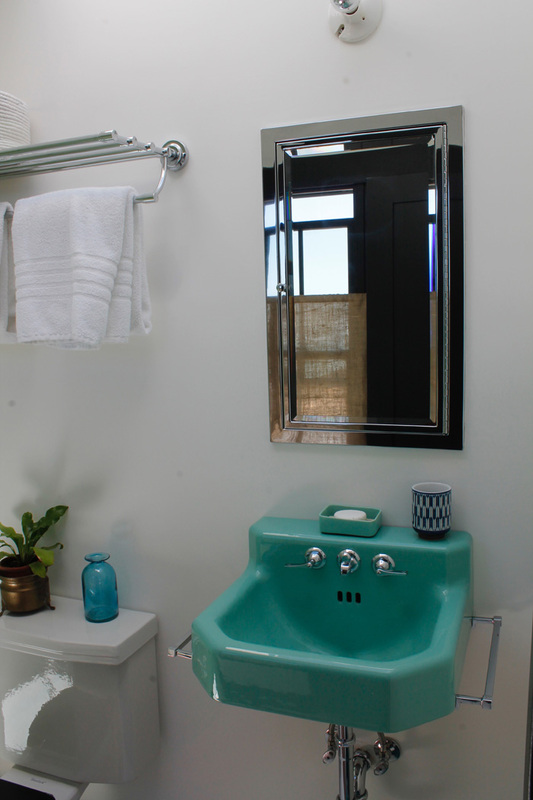 Anyhoo, the new sink, which is a Kohler from 1941 is on the trailing edge of the American Art Deco movement. I have no idea the circa of the toilet but its shape and black seat read of the same era, possibly even earlier. 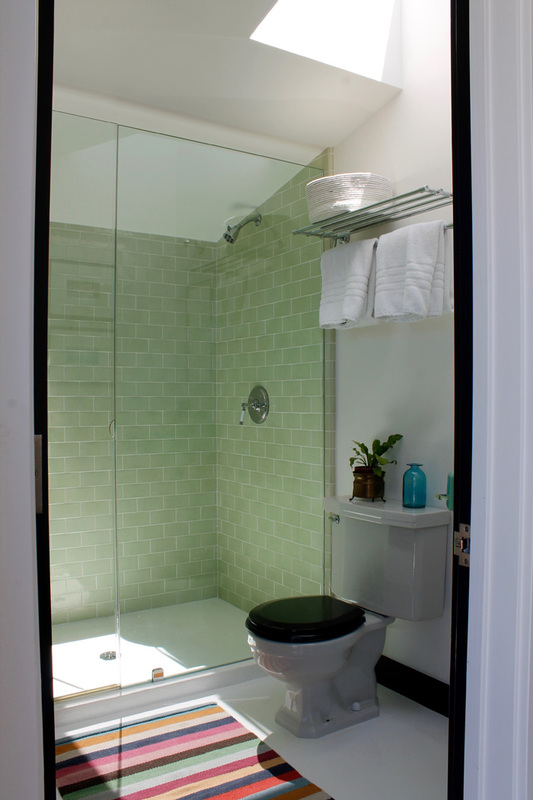 Many bathrooms of this time period used black tile as an accent or trim against green or pink tiles, I thought I'd suggest this idea by painting the trim and door black. I repainted the rest of the room and ceiling in OC-117 (Simply White), which is the color throughout the main rooms of the rest of my house. This room has a beautiful skylight which for me dictates white. I have only a couple design "rules" or hangups to which I steadfastly adhere -one of them is that skylights or angles ceilings should remain the same color as the room. Here, and in general, I think clean modern lines are best shown off in white. While I'm pontificating, I want to also mention something about skylights which an architect once told me and is a completely "aha" truth, which I never would have figured out on my own. 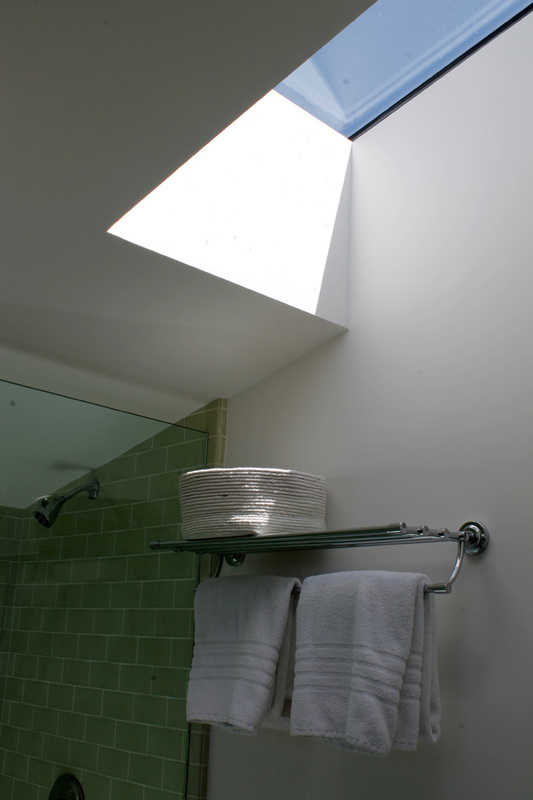 Whenever possible, a singular skylight should have one of it's edges against a wall. That way the light casts down the wall. A skylight that sits in the middle of a ceiling has the tendency to burn out the ceiling plane, making the rest of the ceiling look dark around it. So whenever possible in designing a skylight, go to the edge. The floor on the top level is epoxy. 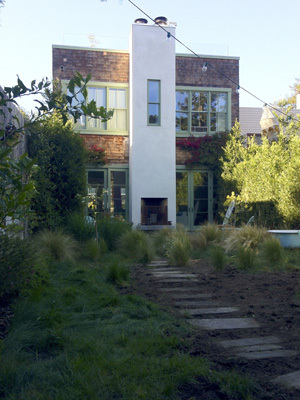 It was one of my bolder choices when building this house. The epoxy goes seamlessly, right into the shower pan. I still love it, but it could probably do with a re-coat -it's a little scratched and less shiny in places of high wear. I've had that Ikea striped rug forever, the front side is completely faded from the sun so now I flip it. It's wool, I wish they still sold this fantastic rug. 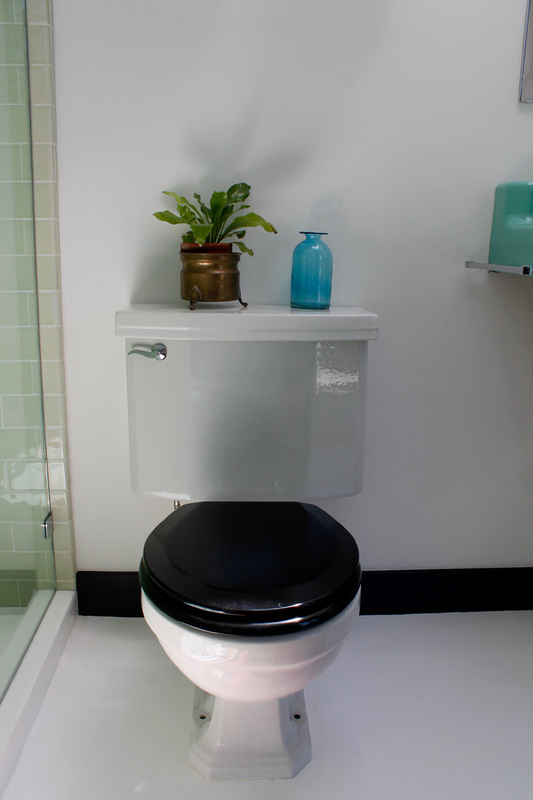 I replaced the white toilet seat in here with a black one. I really like this look in a bath with classic finishes. One of the really nice details of this sink are these little chrome arms which clamp on to the sides of the sink. It is a coincidence that that little soap holder matches. I picked that up at a neighborhood estate sale a few years back. The train rack is from Restoration Hardware, the Asbury line. The porcelain light is vintage -I love this look with a mirrored bulb. And I must say, although I love Electric Schoolhouse -the company, vintage porcelain fixtures are still readily available at salvage yards for a buck each, so no need to blow it out buying new. Ah, black trim. Everything took like four coats of paint. I used Benjamin Moore's Interior Select line in Pearl for the windows and BM Advance line in Satin for the door (the color is a custom mix that I have on all the other black doors in my house). The reason for this is that the Advance line is really great for leveling and acts most like a oil paint but has a 4-6 hour re-coat time. (In California, oil paint is verboten). That was great for the door, but with the windows, since I was removing them entirely from the window frames while painting, a shorter cure time was needed for safety reasons. The sheens of the two lines are indistinguishable. I must say, the Advance line was really great for the door. Most of the doors in my house were sprayed but I feel confident I can do all door re-coats with a brush with this paint, without any flashing occurring. 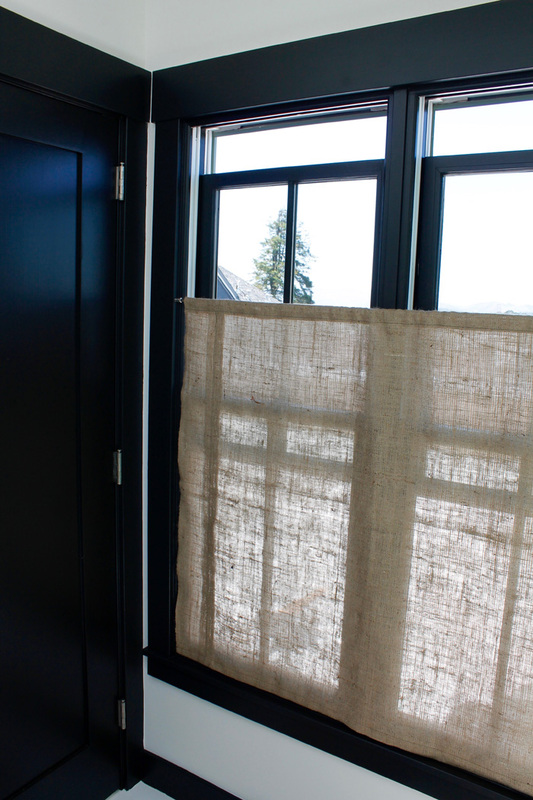 I made these burlap curtains in a like an hour. They are very similar to the ones I made here and I will do a separate post about them next week.